MAHALO (1992) The 83 foot crab fishing vessel Mahalo sank January 18, 1992 near Saint Paul Island in the Bering Sea. The crew of the Mahalo was hauling in a crab pot with 30 others on deck when a severe vibration alerted them of a problem. An inspection of the engine room revealed that water was entering from an unknown source. Attempts to locate the problem and dewater the vessel failed. Soon nothing but the mast was visible above the water. All four crewmembers were rescued by the vessel Sea Producer. MAJESTIC (1992) The 70 foot halibut long line fishing vessel Majestic capsized and sank September 22, 1992 approximately 70 nautical miles south of Saint Paul Island. All five crewmembers were rescued. MAKANI KANALIO (1996) The 39 foot fishing vessel Makani Kanalio caught fire and sank December 14, 1996 at Unalaska. The only person aboard made it to safety. 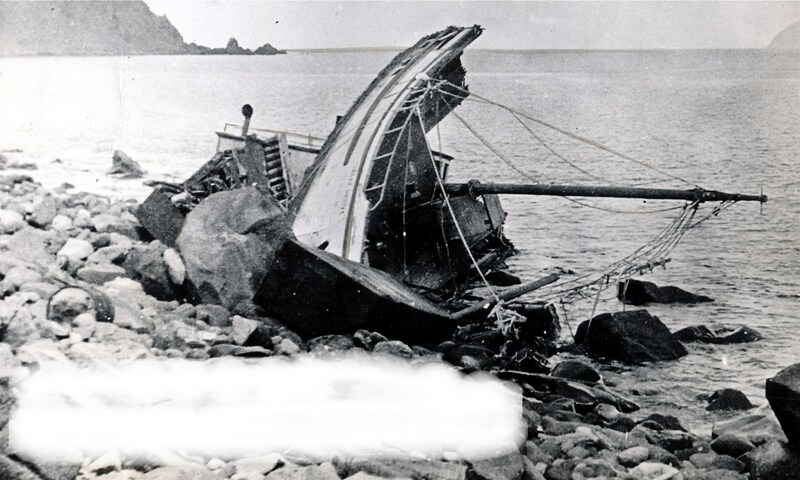 MARSHA ANN (1968) The oil screw Marsha Ann was lost September 27, 1968 off of Adak Island. MARTINDALE (1969) The diesel screw Martindale stranded and was lost March 8, 1969 in Surf Bay on the southwest coast of Akun Island. MARY JANE (1980) The crab fishing vessel Mary Jane ran aground at Unalga Pass November 26, 1980. The crew abandoned ship in survival suits and swam to the beach. They were rescued the following day by the fishing vessel Advancer. Early efforts to salvage the Mary Jane were thwarted by bad weather. MATINEE (1898) The 37 ton schooner Matinee was lost in the Aleutian Island with all hands in 1898. MERMAID (1899) The 273 ton whaling bark Mermaid was lost in a storm at Dutch Harbor October 28, 1899 along with one crewman. The Mermaid had sailed out of San Francisco March 28, 1899 for whaling in the North Pacific. She had the whale bone from two bowhead whales as cargo. The cargo was saved, but the Mermaid, valued at $29,000, was a total loss. The vessel was condemned and later rebuilt for the Nome trade. MINNIE (1900) The two masted 50 ton Canadian schooner Minnie was lost at Ugamak Island July 26, 1900. The vessel was driven onto a reef in a dense fog. The crewmen escaped to safety in lifeboats and were later rescued by the steamer Alliance and schooner Walter L Rich. The Minnie became a total loss. MISS MARIA (2001) The 49 foot longline cod fishing vessel Miss Maria grounded, sank and was abandoned January 19, 2001 in Makushin Bay. The sea valve aboard the vessel began leaking and the crew grounded her to prevent further sinking. All four crewmen abandoned ship to a life raft and were hoisted off of the beach by a U S Coast Guard Helicopter. Fuel was removed from the vessel and salvage arrangements were in process. An interesting point to note is the tale that is attached to the Monongahela, although not related to her disappearance. The first of it was published in newspapers in New York and London in March of 1852. January 18, 1852 the Monongahela is reported to have encountered a “sea serpent” more than 100 feet long while becalmed near the equator. The crew managed to kill and behead the monster. The head was said to be 10 feet long and contain 94 curved teeth. Captain Seabury of the Monongahela had the head stowed aboard in a pine box. He wrote a detailed report of the incident and sent it ahead to New Bedford with another whaling vessel that was loaded with whale oil and bone and ready to return to port. The Monongahela then continued on to whaling in the Arctic. She never made port, and none of her crew survived. The story of the sea serpent survives to this day as a possible hoax or unexplained mystery. MONTREAL MARU (1943) The 6,577 ton Japanese cargo vessel Montreal Maru was sunk by 3 Mitchell Bombers January 6, 1943 near Kiska Island. MORIAH (1995) The 68 foot steel longline fishing vessel Moriah struck a submerged rock and sank August 23, 1995 off of Segula Island in the Aleutian Islands in approximately 37 fathoms of water. She sunk approximately 20 minutes after striking the pinnacle. All seven crewmembers abandoned ship to a life raft and were rescued by the U S Coast Guard cutter Hamilton. MYRTLE (1870) The schooner Myrtle was wrecked in the Aleutians late in 1870.